Kindly hosts in Brunswick, GA turned over their Air B and B to us. The accommodation is a remodeled garage, - were we not fasting we might find the kitchen a bit crowded, but for us, this week, the accommodations are ideal. Egrets, ospreys and vultures glide overhead. Huge live oaks surround us, looming and beautiful, draped in Spanish moss. Tannins released from the oak trees seep into the nearby river, historically a source of fresh water because the tannins killed the bugs. Centuries ago, colonizers would fill huge containers with “brown” water from the river, water in which the bugs couldn’t survive, and use that water for their drinking needs throughout their voyages back to Europe. When we travel along the roads, vast stretches of wetlands extend as far as the eye can see. Recent laws mandate conservation of these marshy grounds. Our small community here longs to preserve all life, to end potential omnicide. During vigils at the Naval Base, in front of the detention center and at the District Court House, we hold banners, one of which says “Disarm Trident, Love One Another. Steve Baggarly, one of the fasters, carries copies of the Treaty on the Prohibition of Nuclear Weapons, negotiated in July 2017, by 122 nations. “Most of the world is tired of being held hostage by omnicidal weapons and wants nuclear disarmament,” said Steve. 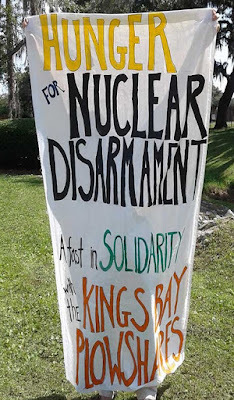 The Kings Bay action was the latest of 100 similar actions taken around the world since 1980 and the first plowshares action to take place since the global treaty banning nuclear weapons was signed. This afternoon, when we ended our vigil, we visited a small park, opposite an entrance to the base, which marks the site of a sugar factory owned by John Houstoun MacIntosh. The memorial plaque in front of the factory ruins makes it sound as though MacIntosh built the factory and mansion. Hardly the case! In 1825, slaves assuredly constructed the buildings and cultivated the sugar cane, risking their lives in the dangerous process. Eventually, small groups of abolitionists working to end the slave trade gained momentum. Disarmament activists today draw inspiration from their struggles. “Nuclear weapons are a theft from the poor,” said fast participant Beth Brockman. Two highlights of the day were conversations with Mark Colville and later Steve Kelly, both of whom called us from the Detention Center. Each had begun the day reading the same reflection we had earlier shared, which included a passage from the Sermon on the Mount. Choosing to “go the extra mile,” our friends who face trial bring to life the spirit of early abolitionists and the ancient call to choose life that you and your descendants might live. Kathy Kelly, (kathy@vcnv.org), a participant in the Hunger for Nuclear Disarmament fast, co-coordinates Voices for Creative Nonviolence.